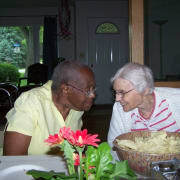 Provides assistance to frail elderly at risk of nursing home placement. Care is provided in a home setting as if the residents are your own family. The residents are low income and have no friends or family to meet their needs as their health has declined. Volunteers serve 3 or more shifts each month. A one year commitment is asked.